Since getting hdd media player with 650GB of disk space I have been doing some large data transfers. But Windows operating system does a terrible job in transferring large files especially to external hard disks. It hangs, it prematurely terminates the transfers, files get corrupted… you name it. 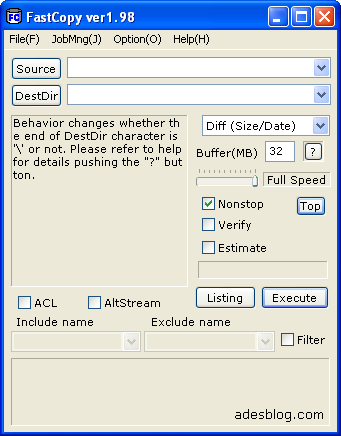 One way to do large file transfers is using MSDOS’ xcopy command, but it can get troublesome using MS Command Prompt especially when you do not know the commands. Luckily there is a better way. FastCopy (freeware) (see screenshot) does the same what xcopy does, and even faster. Since it doesn’t use the cache of OS at all, other processes (applications) won’t be affected (i.e become heavy or hang) by the transfer. It can also verify the copied files making sure that you do not have the corrupted files. Since finding it I have been using it extensively and so far it’s doing a great job. Highly recommend it. Writing blog posts comes naturally to some people, but some struggle to write and convey their message effectively. Following some of the tips below, can improve your blog posts’ quality. Get to the point, will you? It’s very important that you get to the point in the first few sentences of your blog post. If you cannot do that (perhaps the topic is too broad) then at least give an abstract of what you will be talking first. This is to get the attention of the reader from the beginning, and to give them the idea of what you will be talking about in the blog post. So, don’t write few paragraphs building a base for your punchline in your post. Leaving the most important part of the post to the end is a bad idea. Unless you are some politician or celebrity, you want to grow your blog’s readership and reach a wider audience, and by beating around the bush in your blog posts, you will only hinder your blog’s growth. Because new readers tend to scan your blog posts and do not have time and reason to read them in full, sentence by sentence. If your blog is about helping others or teaching them, or sharing your experiences so that they can benefit from it. Then you have to use simple words that everyone can understand. For example, if you have these two different words with a similar meaning to describe a man “sagacious” and “wise“. You should choose “wise man“. 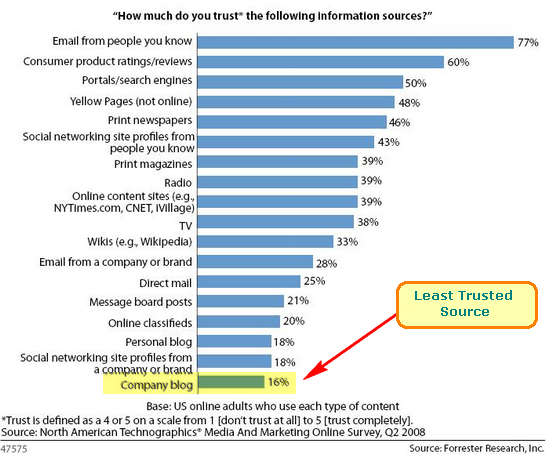 Forrester has an interesting report on “sources of information” and how much people trust them. You can see the results in the diagram below. As you can see, the least trusted source of information is the corporate blogs. With all the “corporate blogging” taking off… at least among Fortune 500 companies, this is a huge information to swallow for the corporate bloggers. However, on the positive side, now that the companies know people do not trust their blog posts, they can start working on various solutions to make their corporate blogging work. Well, perhaps they could use the blog not only to communicate but also to get feedback from their customers and to start building strong community. To genuinely listen to the comments, and provide quick solutions to the problems. Instead of just re-posting press releases on the blogs (i.e too formal), maybe they could choose an informal approach and be closer to their blog readers. Top management should be actively involved in blogging as well. This has many advantages; one – it would make the posts more authoritative. 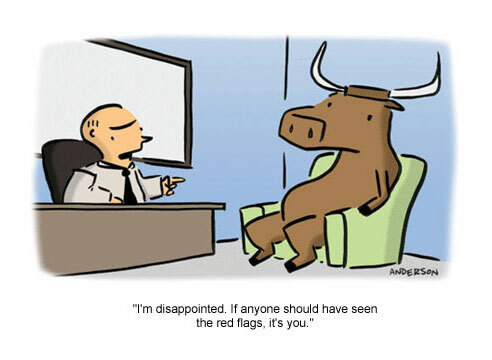 two- people would be more willing to listen to and believe CEO than any other executive. and three – it would have a multiplier effect on the company, because if CEO replies a commenter and says “we will do it”, this would actually turn into an action. So, by just replying to comments CEO would actually be improving company’s products. Companies should definitely try to get this report and study it if they can. I have just done a cleanup of my Gmail inbox. For the first time it’s showing “2 Unread Messages” and not “100+ Unread Messages“. How do I feel? Feel like I had a haircut after 6 months, no no, feel like I just shaved my head 😉 Yeah it’s that good to see so few unread messages in my Gmail. Two little Gmail search strings and a lot of courage helped me to achieve this result. A lot of courage – because some of the emails I intentionally marked “unread” so that I could reply to them when I have a spare time. But the spare time somehow never came 😉 and by now, it was too late to reply to them anyway. Used together as is:unread in:inbox in the search field, it will list all the unread emails in your inbox.